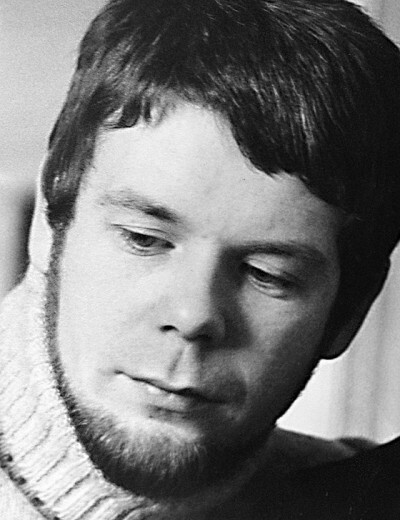 Bill Gibb was born in Fraserburgh, Scotland in 1943. He came from a farming family but was encouraged by his grandmother, a painter, to enjoy his hobby of copying pictures of historical costume, especially that of the Renaissance era. This influence has affected his mot spectacular work. Arriving in London at the age of 19 from northern Scotland, Bill Gibb was already obsessed with the dream of a career in fashion. He trained at St. Martin's School of Art, then at the Royal College under the aegis of Professor Janey Ironside. An unprecedented flow of new talent was to emerge from the college in the early 1960s. For the next three years Gibb worked for Baccarat, the prestigious London fashion house, before setting up his own company in 1972 with a complete team, including designers, cutter, and business manager. In 1974 he produced a knitwear collection working with MISSONI and knitting specialist Kaffe Fassett, which became highly successful. He also opened a retail business in 1975. Gibb was highly acclaimed in the 70's but inspite of his considerable design talents and his skill in handling lavish and exotic fabrics, Gibb was forced for financial reasons to close his firm in the 1980's. In 1977 a ten-year retrospective of his clothes was held at the Albert Hall in London. He died in London in 1988. A retrospective of Bill Gibb's work was held at the Aberdeen Art Gallery, in Scotland, from September to November 2003. This would have been Bill's 60th birthday. He responded to the new predilection for romantic and ethnic clothes, inspired by the folk costumes of Europe or the Near East and displaying, too, a feeling of nostalgia for the dress of an earlier historical age, with his full-length skirts and billowing slashed sleeves. Always an individualist, Gibb was faithful to his own design principles, which relied on the enterprising and ingenious use of textures, weaves, and patterns in fabrics and knitting. Boldly inventive to the point of abandon at times, he mixed and matched materials and colors. His mood was romantic and far out: the effects often larger than life and always unmistakably his own. "I feel," he had said, "rather than dictate. I create a mood." 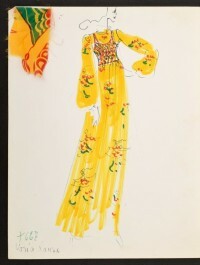 Gibb wanted to create coordinates that gave women choice and pleasure to assemble in the "Gibb style," and with homage to the ethnic feeling of the day, he mixed florals with geometrics, tartans with checks, and produced sunray pleated, beaded and fringed separates, all of which became very popular. Gibb's output during the 1970s was of such a consistently high standard, it verged on couture. He was probably best known for his evening gowns, fabulous concoctions in floaty and exotic fabrics embellished with appliqués or heavily embroidered nets and lace, silks, brocades, and chiffon panels.